I’ve decided that Saturday or Sunday will be Travel day on the blog. 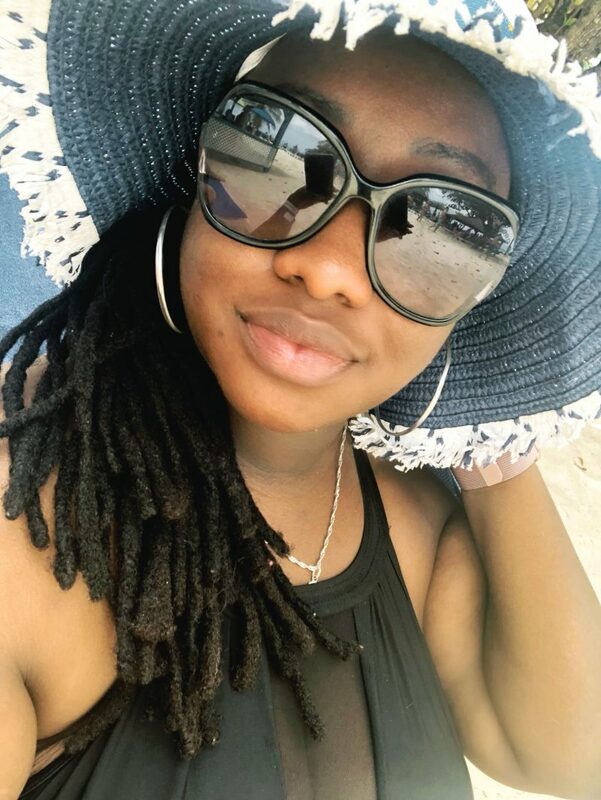 I love writing about Travel and I’ve been to some awesome places, so I want to continue to document that without losing my weekday ‘life’ posts that I also love writing. This is the third post about my trip to India. I wrote about the trip generally in this post, and I documented our visit to Golconda Fort in this post. 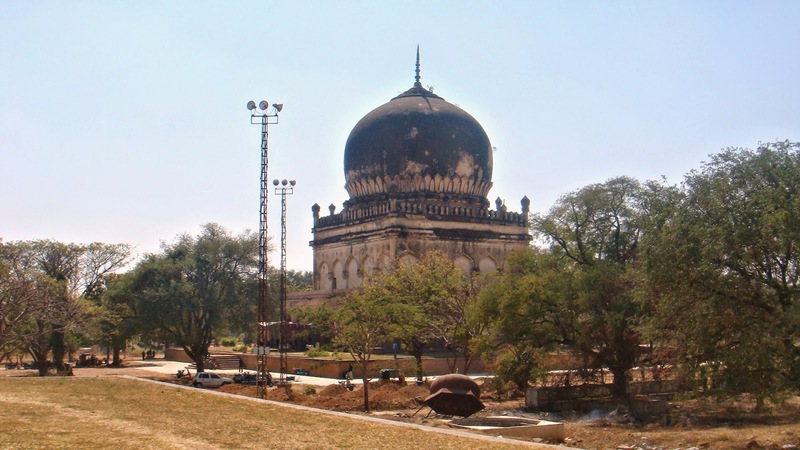 On the same day that we visited Golconda Fort, we visited the The Seven Qutb Shahi Tombs. 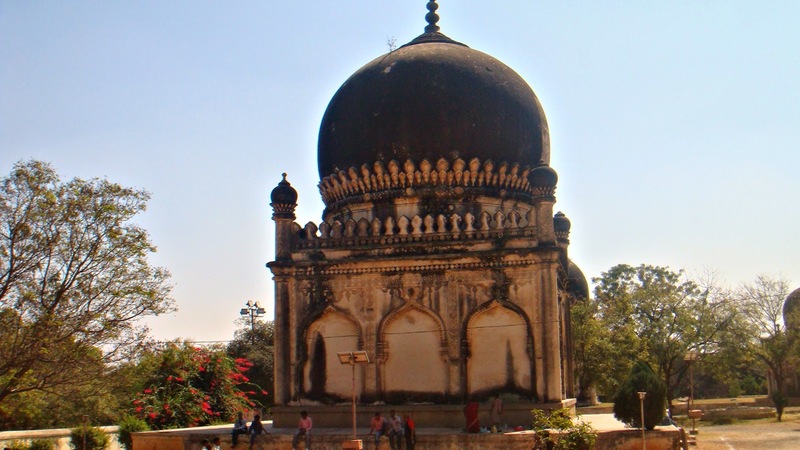 If I’m totally honest, we stopped off at The Seven Tombs before we even got to Golconda! It was a magnificent place! I say that about all the places we visited in Hyderabad, but it is so true. I also will say one more time that I wish I had appreciated it so much more while I was there. Hindsight is 20/20. I think what fascinated me the most about this particular stop was the story and the history behind the Tombs. 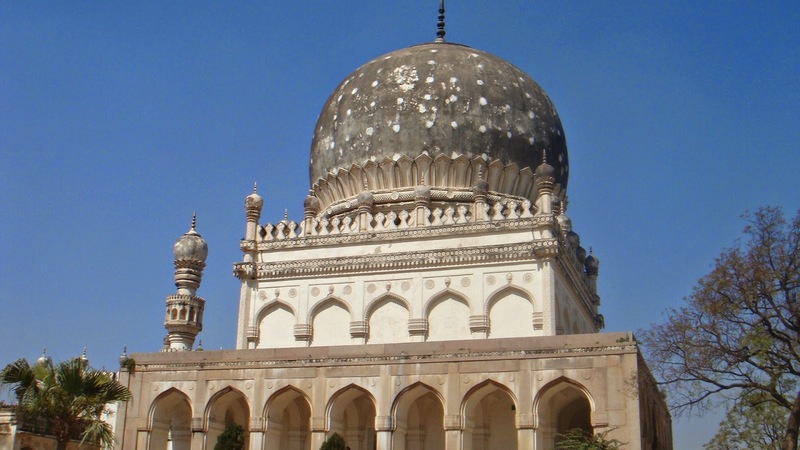 The tombs of the seven Qutub Shahi rulers are located close to the famous Golconda Fort in Hyderabad, India. 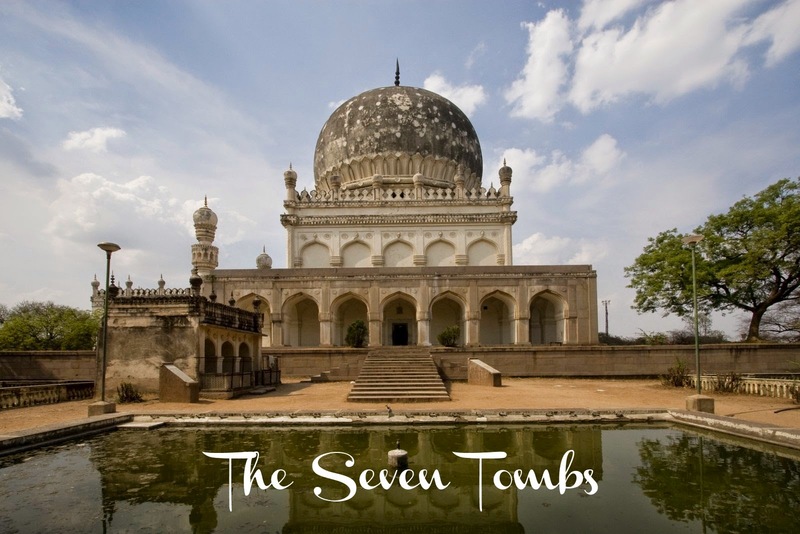 There were seven main tombs and several smaller ones. 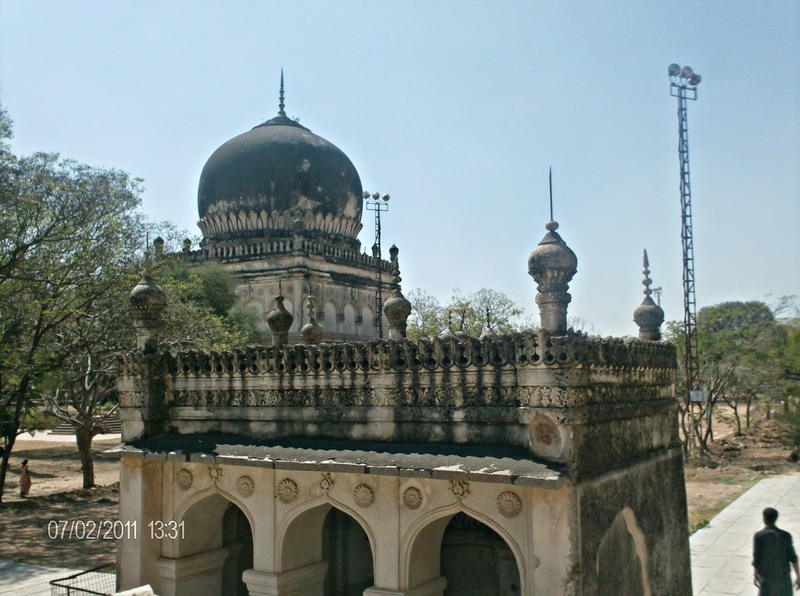 The Seven main tombs house the remains of the founding rulers of Hyderabad. 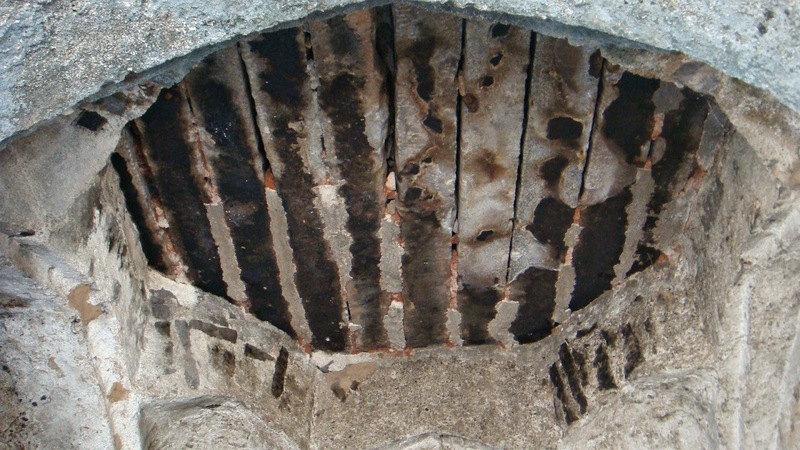 The first tomb to be built on the site, was built in 1524 AD by the first Sultan before his passing. The other tombs followed thereafter. The area now holds over 20 tombs, including those for the seven sultans as well as some of their wives and children. We were able to walk around the grounds and visit each of the tombs. At the time it was not clear which tomb belonged to which ruler but that did not take away from the sheer magnificence of being there. We had an unofficial local tour guide before we decided to just walk around and take in the scenery. What fascinated me the most about the visit, was the architecture. If the timeline is to be believed, then these tombs were built at a time when modern architectural and building advancements simply did not exist. I cannot imagine how these tombs were built and the sheer work it took to achieve such detail. We were told that the style of the tombs are unique to the region. 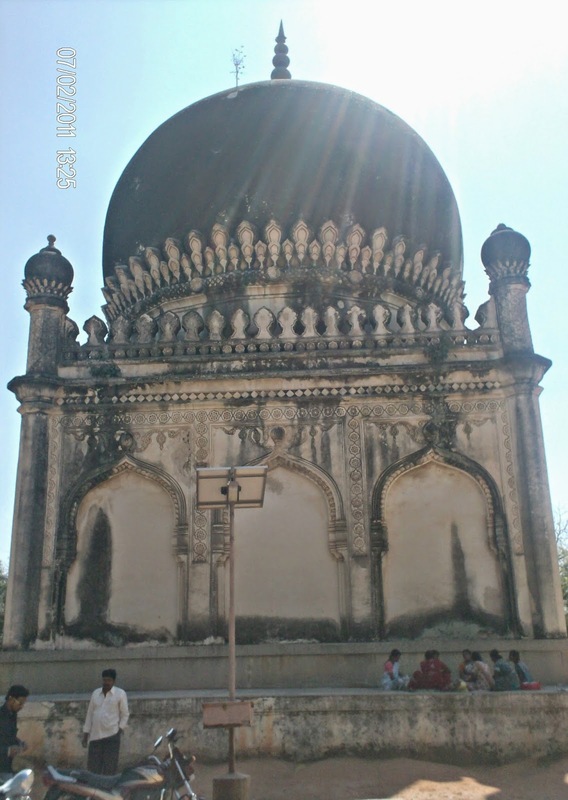 Each of the tombs are built upon a square platform, and have domed ceilings, pointed arches, and intricate stone carvings. 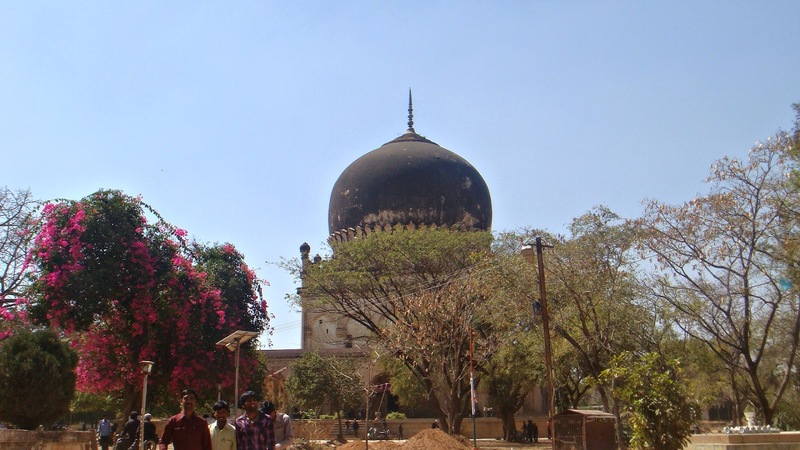 Most of the tombs have a mosque located next to them on the square platform. Apparently, these mosques fuse together Persian, Hindu, Muslim, and Pashtun influences since those are the local residents of Hyderabad. Like I have said in the last two posts, I had two cameras with me and so some of the photo have a time-stamp while others don’t. Anyway, the magnificence of the tombs and the architecture and history fascinated me then and still fascinates me today. 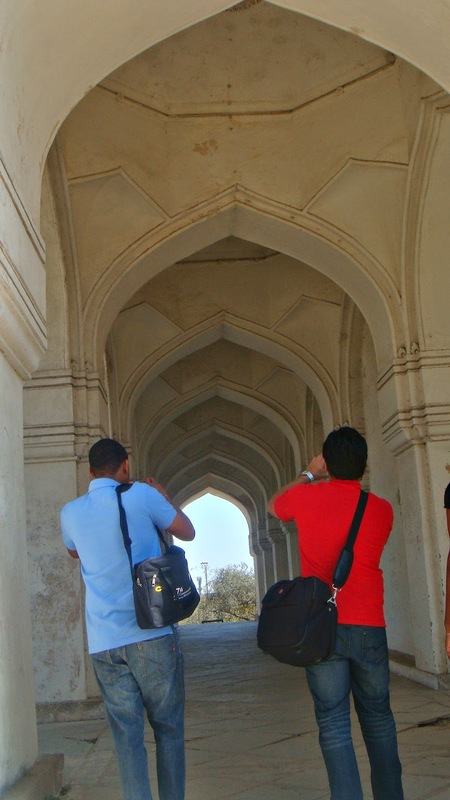 Some of the tombs had large arched entryways and we stopped to take pictures. Unfortunately I cannot find one good picture of me from India and certainly none from the visit to the Tombs! I have hundreds of pictures printed and saved but they are not blog ready and so I hope you enjoy the pics of the site! It certainly was a great visit to such a historical site. When we were done, we hopped into the taxi that we hired for the day and then we were on our way to the next adventure. Next Post Was anyone else late to this party?